Illuminati Unlimited: Are human beings impossible to ape? Chimpanzees share 98.4 per cent of our DNA, but the differences between us and them are still profound, as a new book argues. 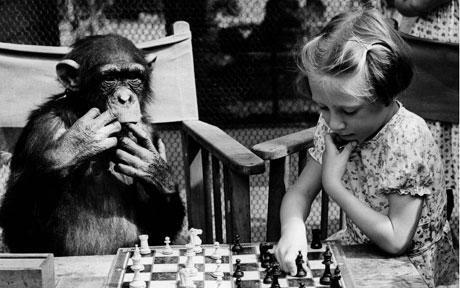 Taylor agrees that chimpanzees "show many fundamentally human skills – to a degree that they have the ability to do maths, think abstractly, demonstrate altruism, make tools and imitate each other. There is nothing humans can do that apes can't do, however simplistically." But, he adds, "we are talking about the difference between using a twig as a tool and using the internet. It is humans that have speech and language, humans that have culture, art, music, science and technology, humans who remember the past, plan for the future, fear death and pay taxes. "Sometimes, amid all this scientific talk of genetic and cognitive similarity, we can lose sight of the most important facts."